What about the "little ice age" from 1550-1850 AD ? What about the hottest summer ever, 1936 ? 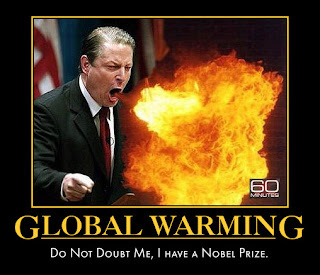 I'm not denying science if it's there, it makes me skeptical because for climate alarmists, the answer to global warming is always massive taxation plus world government. Can we have clean air and water without a fraudulent multi-quadrillion-dollar cap-and-trade program ? Very funny picture to go with your report, Paul, and so appropriate.